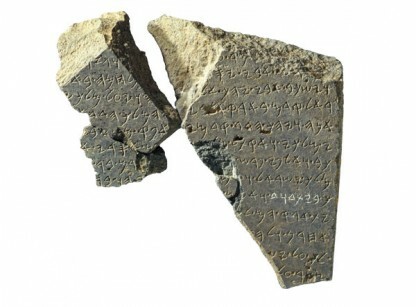 The fragmentary Tel Dan stela, containing the Tel Dan inscription (or “House of David” inscription) provided the first historical evidence of King David from the Bible. The Aramean king who erected the stela in the mid-eighth century B.C. claims to have defeated the “king of Israel” and the “king of the House of David.” Photo: Zev Radovan/www.biblelandpictures.com.